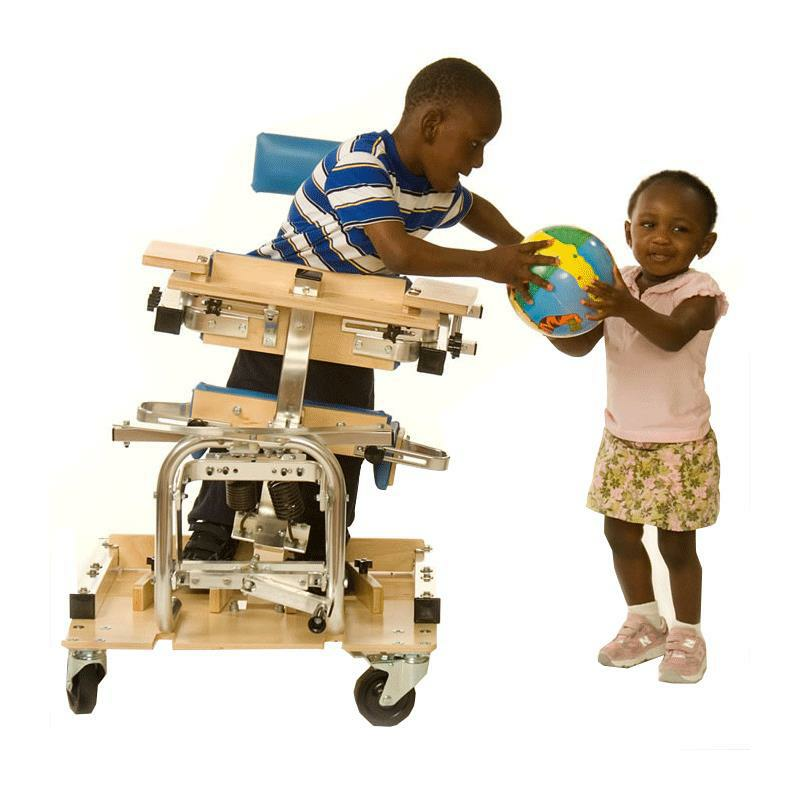 Kaye Dynamic Stander is a multi-positional stander which allows 360 degrees of movement within the base of support while the client is safely aligned in a standing position. 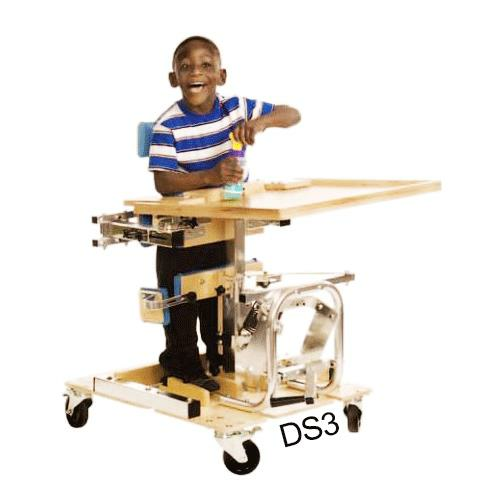 This unique stander is an important innovation for clients who do not develop adequate balance, weight shift or postural control to stand or walk unaided. - The excursion of movement of the stander is adjusted with a spring-loaded crank. Clients who were fearful of moving in standing reported that they felt in control and were not fearful in initiating movement. They could begin by experiencing limited movement within their base of support and increase the range of movement as they developed confidence. The resistance to movement can be adjusted so that clients of many ages, sizes, and weight can work on postural control. - Since sway can be damped down, clients were able to pair postural control with function, experiencing the typical weight shifts that accompany reaching, manipulation, speech, eating and self-care activities. Clients felt less stiffness and activities were easier to perform when they permitted adaptive movements while standing. - Since clients are securely stabilized, therapists reported that they learned to independently activate weight shifting by pushing into the base with their feet as they moved away from the vertical position and brought themselves back to midline. They were able to develop a sense of midline in the vertical position. Height Footrest to Top of Pelvic Support 20" to 29-1/2" 21" to 41"
Pelvic Depth 4-1/2" x 8-1/2" 5-1/2" x 12-1/2"
Pelvic Width 5" to 11-1/2" 9" to 14-1/2"
Tray (standard) 26" x 20" 26" x 22-1/2"